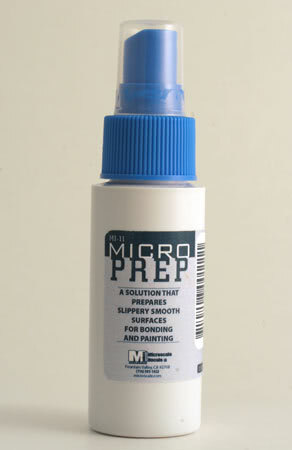 Description: MI-11 - MicroPrep **ATTN: Cannot ship Airmail -- NO INTERNATIONAL SHIPPING -- ** MicroPrep is a surface treatment applied to a difficult to bond surface (Delrin, Celcon, etc.) prior to bonding and/or painting. MicroPrep has a shelf life (2 years) and is affected by temperature. It is best to keep it sealed tightly as it will evaporate when opened. Store in a cool place. The 1.5-ounce bottle is partially filled because the spray attachment needs the extra space. If storing for any length of time, please remove the sprayer and re-insert the yellow seal to extend shelf life.